One half hour stretching, conditioning and warm up, and one hour of barre technique 9:00 to 10:30 am. Break for 15 minutes. 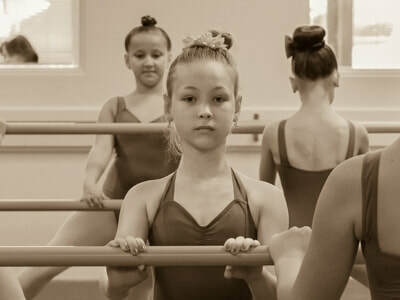 One hour of Ballet across the floor, center work and choreography 10:45 to 11:45 am. Break for lunch ½ hour. One hour of Lyrical technique and choreography 12:15 to 1:15 pm. Break 15 minutes. One hour of Jazz technique 1:30 to 2:30 pm (Saturday Intensives start and end one hour later). Dismissal 2:30 pm $60 Per Day. ​One hour stretching, core work conditioning and warm up 10:00 to 11:00 am. Break for 15 minutes. One hour and half of Jazz across the floor, center work and choreography 11:15 to 12:45. Break for lunch ½ hour. One hour of Contemporary technique and choreography 1:15 to 2:15 pm. Break 15 minutes. One hour of Hip Hop center floor work and choreography 2:30 to 3:30 pm. Dismissal 3:30 pm $60 Per Day. ​One hour stretching, core work conditioning and warm up 10:00 to 11:00 am. Break for 15 minutes. One hour and half of Lyrical across the floor, center work and choreography 11:15 to 12:45. Break for lunch ½ hour. One hour of Turns and Kicks technique and center floor work 1:15 to 2:15 pm. Break 15 minutes. One hour of Leaps and Jumps technique and center floor work 2:30 to 3:30 pm. Dismissal 3:30 pm $60 Per Day.